This miniature dollhouse trunk kit is a lithographed wooden done in a Victorian cat motif. The trunk kit is wooden, 1:12 scale and the truck opens and is newsprint lined on the inside as well. This Lithograph Wooden Trunk Kit - Victorian cat on it is a nice touch for any room in your dollhouse. 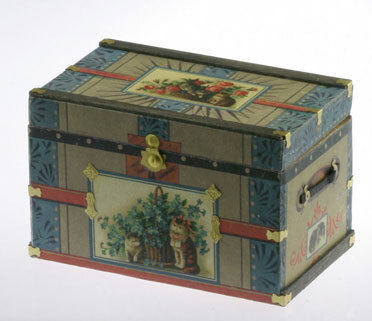 Approximate size of the Lithograph Wooden Trunk Kit - Victorian cat themed, once assembled is 3" long by 2" deep by 2.5" tall and the kit includes instructions, wood, litho printed paper and hardware. This Lithograph Wooden Trunk Kit - Victorian Cat is supplied by Handley House Miniatures, which generally ships within 8 business day(s) of you placing your order .